Shopping for a new commercial grade popcorn machine can be rather confusing. You’ve browsed through hundreds of units for sale on different websites and the features such as kettle size and wattage has you scratching your head. Our goal is to provide you with some information that will make your decision easier. The Basics – Bar Top Popcorn Machines vs Popcorn Machines with Carts. One consideration is whether you are interested in a Bar Top machine or a stand-alone machine with cart. At Carnival Canada we tend to suggest the stand-alone popcorn machines with cart. The main reason is, it’s pretty much a two in one machine. You can use the machine as a stand-alone unit or you can remove it from the cart and use it as a bar top. Carnival Canada offers the most aggressive prices on popular machines. 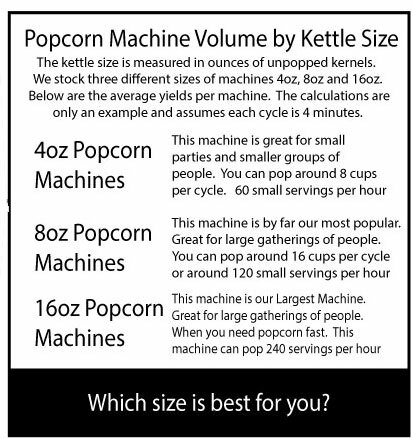 The small price difference between the two styles makes the decision on whether to purchase a stand-alone popcorn machine or a bar top easier. Popcorn Machines measure the kettle size by the measurement of un popped kernels it can hold. The unit of measurement most commonly used is ounces (oz). The popcorn machines offered by Carnival Canada range in size from 4oz to 16oz. The simple math states the larger the kettle, the more popcorn production per batch. The decision on which kettle size is best for you might not be that simple. There are some other factors to consider. More per batch can server larger crowdes while less per batch can be served less frequently for maximum freshness. Both sizes have advantages. Popcorn Machine Kettle Size – Which size is best for me? One (1) ounce of un popped kernels will pop to approximately 2 cups of popped popcorn. A 4oz Popcorn Machine will pop 4oz per cycle which totals 8 cups of popped popcorn. Assuming that each cycle is 4 minutes you can pop 120 cups per hour. An 8oz Popcorn Machine will pop 8oz per cycle, which totals 16 cups of popped popcorn. In 1 hour you can pop approximately 240 cups of popcorn. A 16oz Popcorn Machine will pop twice as much as the 8oz machine making a total of 480 cups per hour. It is also very important to consider the power wattage required to run a popcorn machine. Popping kernels requires a certain amount of heat. If you apply too little heat the kernel will not pop. If you apply too much heat the kernel will pop too quickly before the starch is puffed. The Popcorn Machines offered by Carnival Canada operate at the sweet spot of the power band where heat is optimal. Most modern residential circuits are 15A. So you are looking at a max load of (15A X 120V =) 1800 Watts before the breaker trips. A 4oz Popcorn machine runs at 600 Watts. You can use a standard home electrical outlet without issue. You can in some cases also run small appliances on the same circuit. An 8oz Popcorn machine runs at 860 Watts. You can use a standard home electrical outlet without issue. It would be a good idea to limit the use of other small appliance on the same circuit to avoid tripping the breaker or experiencing reduced power. A 16oz Popcorn machine runs at 1150 watts. This machine will still operate on a standard home electrical outlet however it not advised to run any other small appliances on the same circuit. Which size Popcorn Machine is your best seller? 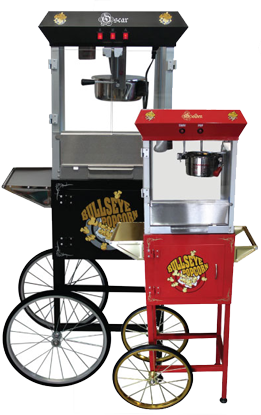 At Carnival Canada, our bestselling popcorn machine is the 8oz with cart. This machine accounts for 75% of our total popcorn machine sales. With this machine you have the flexibly of using the machine as a stand-alone unit or a bar top. You can produce quite a bit of popcorn and you do not have concerns about power supply. This is by far the best quality popcorn machine I have come across. They never seem to last when you buy them from big box stores. Carnival Canada rocks! Hi Thanks for the detailed information. I had no idea what to buy. For me the 8oz was the right fit. We manage an ice rink out here in Edmonton and we've been able to make a profit with popcorn sales. The machine is operating all day sometimes.